A company providing outdoor sports video recording solutions was looking for a way to provide a more effective, robust, and rugged product. Sports products of this kind must be straightforward, easy to use, and able to operate reliably in a wide range of environmental conditions, so they can be used at any location. The company’s existing solution consisted of an HD video camera and video capture box, connected to a laptop. A WiFi router was used to transfer video data wirelessly from the laptop to smart devices and tablets held by coaches, to review and analyze player performance. The existing solution was bulky and inconvenient. Carrying and operating multiple components (separate camera, laptop, capture box, and router), was cumbersome. The components themselves were all vulnerable to adverse weather conditions (especially the laptop), and the fanless devices would overheat in high temperatures, causing malfunctions such as frame drops, system lag, or even total system crash. The company needed a single component solution which would fit within a small portable form factor, and would be sufficiently rugged for long term outdoor use. The system was required to perform reliably under hostile environmental conditions, and provide stable and reliable full HD video capturing over HDMI while placing a very low demand on the system’s CPU. AVerMedia assessed the company’s requirements and proposed an appropriate solution. 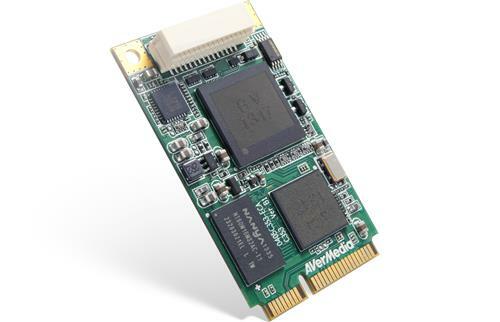 An AVerMedia video capture card was selected as the core of the new system; the C353W Extreme Temperature Mini-PCIe card. The C353W HD video capture card was chosen specifically for its suitability to the customer’s highly specific needs. A full HD capture card, its Mini-PCIe form factor and slim profile make it ideal for applications with significant size and weight constraints. Built to exacting design specifications, the C353W is highly robust and provides reliable long-term performance even in extreme environmental conditions. Intended specifically for rugged and industrial use, the C353W operates consistently within an extraordinary temperature range; -40°C to 85°C (-40°F to 185°F). Critical components are soldered onboard, and the card’s suitability for rugged application is certified through a number of tests under demanding conditions. With an added daughterboard, the C353W can capture video at up to 60fps via HDMI, encoding using H.264 hardware compression at up to 60Mbps and 30fps. As a hardware encoder video capture device, the C353W takes the burden of video processing tasks away from the system CPU, ensuring a stable, high-quality video stream while the CPU attends to system critical operations. The C353W’s broad feature set includes VESA video input up to 1080p60 and simultaneous hardware compression and raw data previewing. The system solution was made possible due to the C353W’s extensive feature set and exceptionally robust construction. Thanks to its miniature form factor the C353W was easily integrated, fitting inside the chassis without adding to the product’s physical footprint. The standard Mini-PCIe interface enabled the C353W to be fully incorporated into the system with ease, and its broad feature set eliminated the need for additional devices. 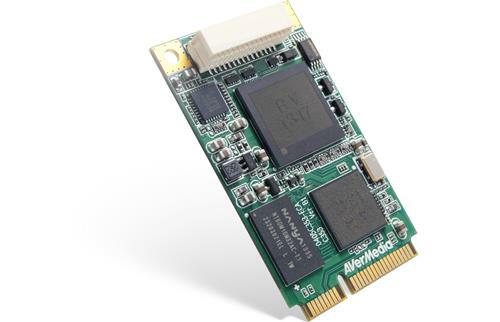 Instead of the original clumsy arrangement of a separate video capture box and laptop, AVerMedia PCIe mini card capture solution allowed a unified system within a single device, solving the size and weight problems of the original arrangement. System integration also reduced costs and eliminated both compatibility problems and the danger of the video capture device becoming physically detached or disconnected from the recording system. The C353W’s powerful encoding hardware ensured totally reliable video processing without placing any additional burden on the system CPU. Additionally, encoding directly to the preferred video format enabled the system to transmit processed video to client devices over WiFi immediately, without the necessity of an intermediary such as a Content Delivery Network. Reliable long term performance outdoors, in extreme environmental conditions, was made possible by the C353W’s robust design and construction. Incorporation of the video encoding solution within the device’s ruggedized chassis, provided additional protection. The result was a solution exceeding all of the project’s key requirements.